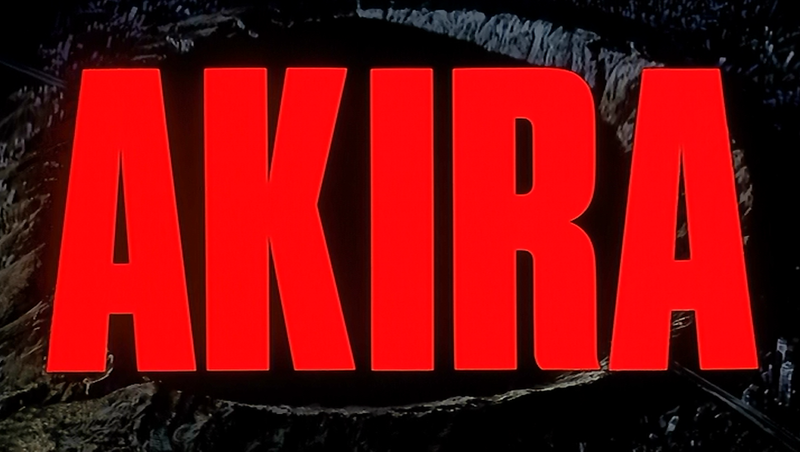 AKIRA changed the genre forever! Kaneda: The leader of an unnamed motorcycle gang who is at war with a rival gang known as “The Clowns.” He has the most badass bike in town! Tetsuo Shima: A scrawny young kid who is life-long friends with Kaneda. They met in nursery school when Tetsuo was beaten up by bully’s and kaneda fought them to get tetsuo’s toy back for him. After that, they became good friends. Kaneda taught Tetsuo how to ride a motorcycle. Kei: Not a member of the gang, but part of the Revolution that is taking place against the government. 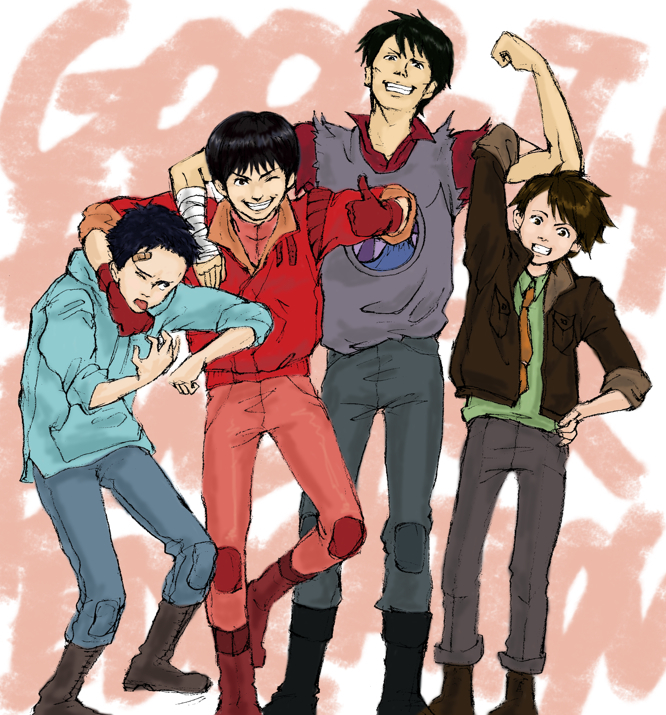 From left: Tetsuo, Kaneda, Yamagata and Kaisuke – The main gang! Their friendship isn’t without its rough times. Kaneda seems to constantly ride Tetsuo about him wanting to ride Kaneda’s bike, saying that it has been customized just for him and a kid like Tetsuo coudln’t handle it. When Tetsuo claims, “I could ride it!” Kaneda smartly replies, “yeah yeah. Don’t make me laugh! Maybe with you down your first Clown!” And the gang quickly takes off towards the express way where it was reported by Yamagata, a member of their gang, The Clowns were cornered. This causes a haphazard motorcycle chase through the financial district where The Clowns are being chased by Kaneda’s gang close behind. The Clowns waste no opportunities causing public chaos, throwing homemade bombs at cars and trying to take down pedestrians left and right. Kaneda’s gang are finally able to move the fight to the freeway. And this is where Tetsuo’s fate changes forever. Tetsuo, after wiping out from taking a turn too fast, catches up with a Clown, only to have the Clown hit his Nitro to try and outrun Tetsuo. The Clown ends up crashing and rolling for a good distance from his bike. Tetsuo wastes no time clubbing his enemy as he quickly rides by. Feeling proud for downing his first Clown, he looks back and yells, “Nice catch!” The moment he looks forward, he sees a young boy directly in the path of his motorcycle! Unable to stop or swerve out of the way, Tetsuo yells in panic. The boy throws his hand forward, and his bike explodes in a massive fireball. A few blocks away, Kaneda and the gang pull a Clown from some wreckage. They hear and see the explosion a few blocks away. Seeing that the body wasn’t Tetsuo, Kaneda and the boys roll out to investigate the explosion. I like this short scene because it shows that though they may give Tetsuo a hard time for being small and, as far as they know, haven’t downed a Clown yet, they still care for him as one of their own. This friendship dynamic comes into play in more depth later in the film. As the gang arrives, Tetsuo is barely conscious, laying on the ground, reaching for the “child” that appears to be ok from the accident. The child looks as though he is about 80 years old?! Kaneda arrives and runs to his friends side to see if he is ok. The others in the gang start talking about what they should do to help the fallen Tetsuo, and while they are doing that, Kaneda notices the “child” that is trying to escape, yelling at him to stop. As the “child” looks back at Kaneda with fear in his eyes, a light starts to shine around the boy. The all of the sudden military cargo helicopters appear all around the group, hovering in the sky. Needless to say, the gang is overly confused as to what is going on. One of the helicopters lands and troops disembark and surround the group, rifles drawn. After the troops have Kaneda and the others on the ground, another old looking child exits the chopper and goes over to the other child and tells him that it they weren’t meant to exist in the outside world and that it is time to go home. While that is going on, the military’s Colonel walks out and asks a Sargent what all of the “rubble” is about. The Sargent replies, “just a couple of bike punks, sir!” The Colonel walks over to the two old looking children and says, “It’s time to go home.” As the troops begin to board the helicopter, they start dragging a now unconscious Tetsuo on to the chopper. When he is moved, blood starts to trickle from his mouth. 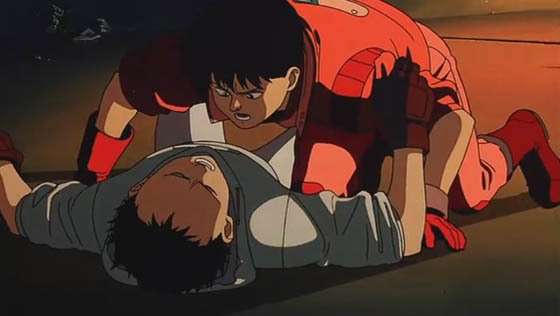 Kaneda, being protective of his friend, gets up and tries to help Tetsuo, only to be rifle butted in the gut. Kaneda concerned about Tetsuo after his crash. Before all of that took place, we were shown the civil unrest that has engulfed the city of Neo-Tokyo. The parts of the city that aren’t overrun with gangs are host to riots against the current government, which we see is on the verge of becoming a military state. This has become known as the Revolution. During this scene, we see a man taking the old looking child through crowds. We see the man has been shot in the side, but he is still going strong, dedicated to taking this strange child to wherever he is taking him to, or keeping him safe from. The man and boy end up in a clear spot away from the rioters, only to have them spotted by military crown control and then fired upon. The scene cuts to Kei and a man named Roy, who appear to be upset that the man and child were spotted. The child vanishes after the man helping him dies, and Kei is shocked to see this, stating to Roy, “He vanished!” We later connect the dots and realize that Kei and Roy were meant to meet up with this man to take the boy to another location having to do with the Revolution. Not believing that the police and the army could be working together, and that no one ever thought the state of affares could breed such a thing, they are lead back to a holding area, where Kaneda sees Kei, and recognizes her from a photo from the interrogation office. Just as he sees her, a fight breaks through the door of the interrogation office the gang was just in. Looking to see what is going on, a group gathers. The man that was fighting the police gets up and pulls out a grenade. Pulling the pin, he yells, “To the Revolution now!” Naturally, everyone flees for their lives. But, to everyone’s surprise, the grenade doesn’t go off, and the man is quickly tackled and beaten by several muscular police officers. In the distraction, a police chief says that Kaneda’s gang is free to go, and that their school has been notified of their charges. Kaneda asks about Kei, claiming that she is part of their group, and the chief says they can take her too. Kaneda doesn’t waste any time showing his interest in Kei, trying to use the revolution to get a chance to talk with her. He even goes as far as to offer the use of his motorcycle gang as “carvery” for her group, that at his point in time, he really doesn’t know she is a part of. It makes sense that he would connect the dots at this point: Police station full of rioters against the government, seeing an officer looking through photos and seeing Kei’s picture… if Kaneda can figure it out, then one would think that it should be obvious even to the cops in the police station! But no… they just let her leave without even a second glance! Thanking Kaneda in a brushing off manor, Kei runs off. And when Kaneda yells at her, “The least you could do is tell me your name!” an explosion happens behind him. The grenade from earlier has finally went off with comical timing!